Recounted. Nine swimming pools as swimming pools. This book recounts Nine Swimming Pools and a Broken Glass by Edward Ruscha in textual snapshots. The snapshots are taken from modern American literature predating 1968 (they may even be imagined to have influenced Ruscha). They can be read but they can also be looked at: the words are objects in disguise. 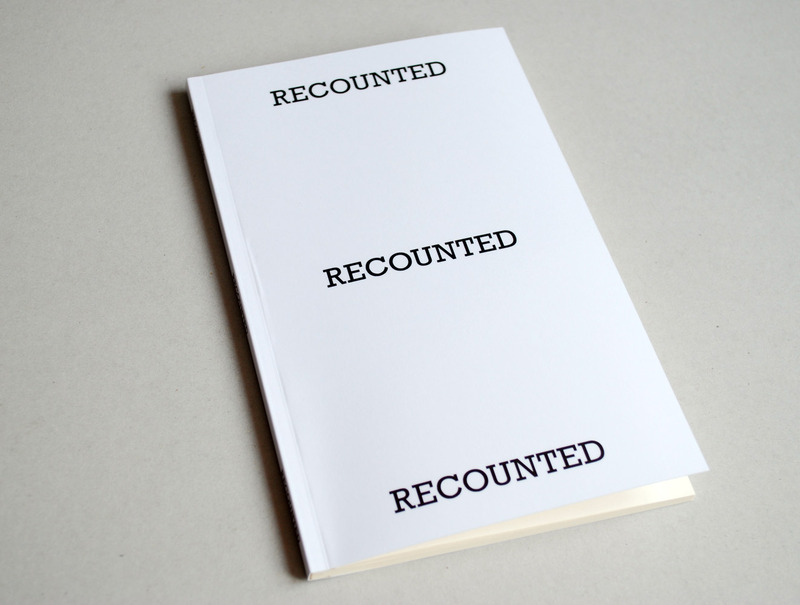 Recounted was made as part of the ABCED project realized by ABC Artists’ Books Cooperative in celebration of Ed Ruscha’s 75th birthday in 2012. It was available for one year only, until December 2013, when Ed Ruscha turned 76. See a few scans of some spreads of the book here. Published by Elisabeth Tonnard, September 2012, Leerdam, The Netherlands. Black and white print-on-demand book, perfect bound, 5 x 8 inches, 64 pages. The book is included in the collections of the Bayerische Staatsbibliothek, Cleveland Institute of Art Library, Erfgoedbibliotheek Hendrik Conscience in Antwerpen, International Center of Photography Library (New York), Kunstbibliothek (Berlin), National Library of The Netherlands (Koninklijke Bibliotheek), Zentralinstitut für Kunstgeschichte (Munich). I guess maybe I woke up in a cold sweat once and just had this light bulb go off of doing a book of some sort. This is how Ed Ruscha, in a 2004 interview, recalled the events that led him to start creating books. The books he started making half a century ago were influential for generations of artists. To honour his contribution to the artist’s book, members of ABC Artists’ Books Cooperative launched ABCED in Autumn 2012. ABCED is a multi-volume book project created on the occasion of Ed Ruscha’s 75th birthday, consisting of 33 books by 24 artists. All books are print on demand, 8 x 5 inches, softcover. Books were available individually from the artists or in a boxed set containing all 33 books (see here).